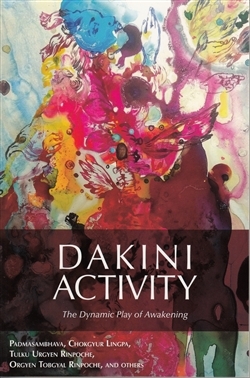 The source of activity is the dakini. There are five kinds of activities: peaceful, increasing, magnetizing, subjugating, and the supreme activity. The primary way to perfect these is through dakini practices, exemplified by the collection in this book. These vast treasuries of practices can be condensed into those of the three roots: lama, yidam, and dakini. The source of blessings is the lama, the source of accomplishment is the yidam, and the source of activity is the dakini. The one who carries out the activities for the lama and yidam is the dakini. In other words, the virtue of blessings and accomplishment is the activity, which is the dakini—both wisdom dakinis in space and worldly dakinis. Pema Khandro practice connects us with magnetizing activities.